It seems the posts I write about my husband are the most popular around here. I once wrote about how I entertain myself at The Home Depot when he won’t leave. I also pondered about whether or not he had another love once. That post still gets a lot of hits, too. He provides me with plenty of material. The way he said it made me look down and immediately start laughing hard, but in a way where I was trying to hide it. My shoulders were shaking. My mouth was trying hard at stifling the laughter. That is the only way we get out of serious conversations and arguments. This usually works, but not so much at the fast food restaurant. WOW. Wow, wow, and wow. 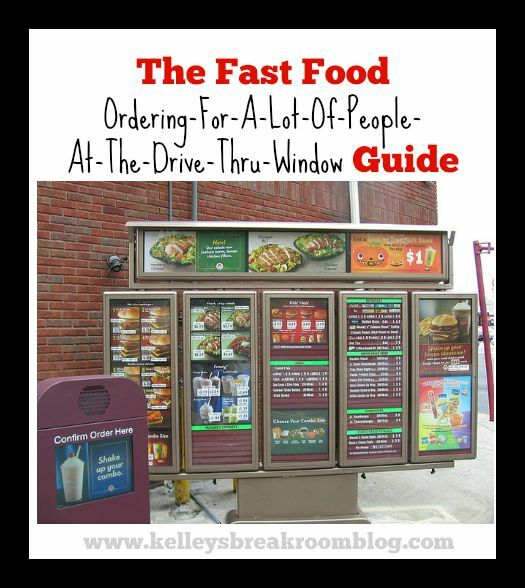 My husband can’t handle ordering at the fast food restaurant for all of us. He just can’t handle it. So, I’ve decided to write him out an ordering guide. I wrote it in a blog post in case you needed to pass it on to someone in your life. Go ahead and change up the parts that don’t apply to you. *Let’s just get this out of the way now. There is no need to say, “This isn’t [insert fancy restaurant name]!” We know that. We can read. There was something about the golden arches that told me we weren’t at [insert fancy restaurant name again]. I still want extra lettuce in my chicken wrap. Now, tell the nice lady. *If I order a chicken wrap, can you make sure to ask for a fork? They won’t just give you a fork when you order a chicken wrap because you eat wraps with your hands, except I like to eat mine like a salad. Yes, I do. Yes, I do. I do eat mine like a salad. Yes, I do. You just haven’t seen me do it. I open it up and eat it like a dingdang salad. *Try getting the orders before you cruise up to the ordering area. Write it down. Take deep breaths. If you don’t write it down beforehand, you are limited to only 3 eye rolls and 2 deep sighs and only 1 combo of the two. *If we are paying the money, I want it how I want it. Can you ask them to make the tea half sweet and half unsweet? *Always remember that if they can’t make it half sweet, half unsweet, you can get 2 Splenda packets. (If you feel like the person at the drive thru window isn’t too judgy, ask for 3. I don’t ask for 3 usually because I don’t like imagining fast food people talking about the girl who has an addiction to Splenda behind my back.) It’s best to have them placed into the drink before they hand it to you. If they don’t do that sort of thing, make sure to get the Splenda packets. Also, most tea lovers want lemons in the tea. Make sure to ask if they have real lemons. If they don’t have real lemons, most people don’t want any lemons. Packets of lemon juice are the worst. Why aren’t you writing this down? *You say you love your family, but if you don’t know the names of the sauces that we like at Chick-Fil-A, how can you even say that? Chick-Fil-A sauce and Polynesian. Two of the first and one of the second. Make flashcards. *Don’t super size the whole order, just the drinks. If they ask if you want to super size the fries, say no. If you say yes because you are just wanting to get this thing over with, I might have to call over your shoulder to just super size the drinks and that’ll make you grumpy. *I realize we’ve been at this window for a good thirty minutes now, but did you ask for just ketchup on the boys’ hamburgers? They don’t want mustard and they don’t want mayonnaise. You can’t just say “ketchup only” because they’ll leave off the lettuce and the tomato and they’ll eat that. Oh, also make sure to ask for no onions. One of the hamburgers should come with pickles. *Oh, back to the tea. I LOVE flavored tea but I’m going to need you to ask the nice teenager if the flavored tea is a brewed tea or flavored by using a syrup. I can’t take the syrup in my tea. Please, just ask! We’re paying for this tea! But, let’s not talk about tea for too long because then I’ll be reminded too much of the time I was hijacked at the mall by the uppity tea people. *I know the line behind us is stretching underneath the Interstate and into the next town now, but be sure to ask for extra napkins. See if they have those hand sanitizer wipes that Chick-Fil-A supplies. Just ask. It doesn’t hurt to ask. Please, just ask! You didn’t ask! BIGGEST TAKE-HOME: Write it down and kwitchercryin. I really can’t imagine why my husband thinks ordering at the drive-thru window is such an ordeal. It all seems pretty simple and straightforward to me! Still, because I am so considerate, I thought it was best to come up with this guide for him. And, no, I don’t want to order because that means I would have to be driving and how can I read my Us magazine and drive at the same time? If you have anything that needs to be added to this guide, you know I want to hear!